The arrival of spring signifies the end of winter, and children and adults alike have more of an urge to be outside. The notion of "spring fever" occurs as people are tired of staying indoors through cold weather and are anxious to enjoy the sunshine, blooming flowers and green plants. Spring can affect children in other ways as well. They must stay in school, as they are not quite ready for summer, yet the classroom may be the last place they want to be. Additionally, spring can bring health conditions that evolve with the advent of this season. When spring arrives, the weather becomes beautiful. It may be more difficult to keep kids in school and concentrating on their work when they want to be outside in the sunshine. Spring typically arrives as the school year is coming to an end and children may be tired of the school routine. After the long winter season, they may want to play more and work less. Kids often become restless and are more rowdy in the classroom. Teachers may find that their students are more disruptive. For kids with learning disabilities, the capacity to concentrate may be even more difficult. Even toddlers and preschool children are affected by changes in spring. The days are getting longer and when bedtime arrives, it may still be light outside. Kids may have more trouble going to bed at night and their sleep patterns may be disrupted because of the weather. Children may suffer through more allergies symptoms in response to environmental stimulants. The increase in pollen counts often results in itchy, watery eyes and frequent sneezing. This can lead to increased irritation and potential nosebleeds. Beginning in March and April, pollen from trees often causes allergies to flare up. Mold counts also start to rise beginning in April and extending into summer. 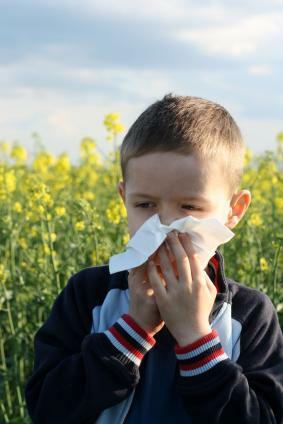 Most kids do not develop seasonal allergies until they are at least two years old. If your child has suffered from seasonal allergies for at least six months, your doctor may prescribe an allergy shot for relief. Some over the counter medications, such as antihistamines, are often used to reduce symptoms. While these may provide relief, kids may also feel drowsy when using them. This may further compound problems at school related to your child's attention span. Children with asthma may experience an increase in wheezing and asthma attacks during the spring season. Asthma occurs when the small muscles of the airways leading to the lungs begin to spasm. This makes it difficult for a child to breathe; mucous may collect in the air passages causing coughing, and your child may make wheezing sounds as she tries to take a breath. Asthma is a chronic condition, and asthma attacks are often triggered by stimulants in the environment. Some types of stimulants include pollen, pet dander or mold, or asthma may also be triggered by exercise. Spring weather brings an increase in these types of stimulants as your child may be exposed to more outdoor triggers. Even if kids are struggling in school or with health issues related to the spring season, maintaining routines and keeping up with discipline is important to keep everyone on track. For children who are managing allergies or asthma, parents should maintain a regular schedule without pushing kids too much, which may cause a decline in health. Keep the same schedule and expectations for homework and house rules. Maintain regular discipline patterns to reign in rowdy and disruptive behavior. Talk with your doctor about the best method of treating your child's asthma and allergies so that the treatment will be least likely to disrupt her schoolwork. Increase your time together by taking walks or spending time outdoors after school or when homework is done. Try to maintain regular sleep habits to keep your kids healthy and to prevent them from feeling run-down. Give your kids plenty of chances to spend time outside while allowing for rest periods when they come indoors. Although spring seems like a time of new beginnings after a long winter, this season can negatively affect the behavior of children and their overall health. By sticking with your regular routines, you can reduce stress in your child's life. This will help him enjoy the season and before you know it, summer will arrive.